Everyone wants to convince you their small vehicle feels big inside. With car companies moving to more B and C class segment platforms to appease the desire for more fuel efficient cars in America, the marketing must find creative ways to illustrate, through images or words, how roomy all these new small cars really are, even if they are not. Americans like big and small products still need to be sold as such. One interesting example of creatively showing a "huge" interior from a small car comes from BBDO for their client Volkswagen. 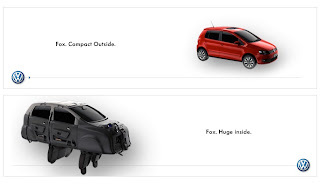 The ad markets the VW Fox (not available here in the United States) with the car's interior being pulled inside out to reveal the interior in an interesting fun way. The banner uses a slider that changes the car from the beginning to end frame shown in the image above. You can also play with the banner at BannerBlog here. It is a clever execution and maybe there is a way to use this technique in a more interesting way to communicate a vehicle's inner beauty as I feel it isn't really that effective at communicating the interior as roomy or "huge" as the ad copy reads. It is playful, but does one really get the idea the car has decent dimensions inside? Not quite.